Here’s a question (or two) for all you crocheters out there. When you make a granny square, do you do zero chains or a chain one in between each cluster? And in the corners, one chain or two? Normally I do one chain in the corners and none in between each cluster of double crochet (treble UK). But I had this book from the library, Visual Quick Tips Crochet, which said to do a chain in between clusters and two in the corners. The verdict is: I prefer my old method. This square is a little skewed (which happened with my last largish squares too – not sure why) but when I hold it up it is very wavy and needs some stern blocking. If anyone has any helpful tips for making perfect squares, I’d love to hear from you in the comments. This square is destined to become a bag. Thought I’d try folding it in half, seaming up the ends, and gathering in the top with some extra rounds of dcs. Not sure how I’m going to do the handle yet. I don’t usually do any between clusters and usually 2 on the corners depending on the thickness of the yarn. I am a bit different, no chains between clusters and ch3 at the corners. If my squares are curling up on the edges, a bigger hook usually helps. If too wavy I might try a smaller hook. 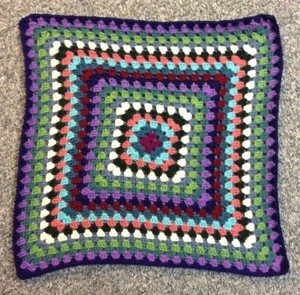 I don’t usually make really large granny squares, so can’t say how it works out for that. Thanks everyone. Sue, I’m sure that the twisting only really manifest with the larger squares. If you’re only doing four or five rounds, then it wouldn’t show. If I made a large blanket, it would have a very interesting swirly thing happening. I intend to block this square today, before going any further with this bag.